Now that I’ve introduced the Flower Garden Banks in a broad sense, I can get into the specifics of the conservation status of this National Marine Sanctuary. It’s pretty much common knowledge at this point that globally, coral reefs are not doing very well. A variety of factors, many of which can be traced back to human influence, are altering the very fragile balance of abiotic and biotic conditions that coral reefs depend on for survival and growth. Last week, I established that the Flower Garden banks were special in that they remained pristine compared to other reefs around the world: seemingly unaffected by the bleaching events that plague many of these other reefs. In this post, I will discuss a recent and bizarre turn of events which contradicts the claim I made in my first post. 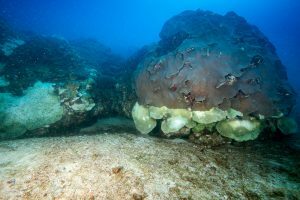 The East Flower Garden Banks, which together with the West and Stetson Banks comprise this National Marine Sanctuary, has been undergoing a bleaching event since last summer which has caused considerable damage to the reef. These images, courtesy of FGBNMS/G.P.Schmahl, depict the different patterns of coral death that afflicted the East Banks last summer. Note the bottom-up pattern of death which could shed light on the nature of the die-offs. Despite extensive sampling and effort, no definitive answer could be given for the cause of the die-offs. Temperature conditions had not been out of the ordinary. The same can be said of salinity and nutrient upwelling events.1 Shipping activity records were reviewed and ruled out the possibility that a ship could have somehow polluted the water in the area. While direct causes of bleaching events can usually be traced by looking for changes that abiotic conditions such as temperature, salinity, nutrients, and light out of tolerable ranges, no such changes were present at the East Flower Garden Banks. Instead of these traditional causes, it could be worthwhile to examine other aspects of the reef that could have been thrown off balance. The two main coral species that form this reef are Orbicella franksi and Pseudodiploria strigosa2. We know that there are differences in the way that these corals fertilize and release their larvae into the water column: Orbicella franksi fertilizes slowly and disperses larvae across vast expanses of sea, while Pseudodiploria is more effective at settling into local areas.2 Together these corals are effective at proliferating themselves and building up the reefs that form the Flower Garden Banks. A disruption of these processes, perhaps of unknown origin, could be the cause of last summer’s die-offs. 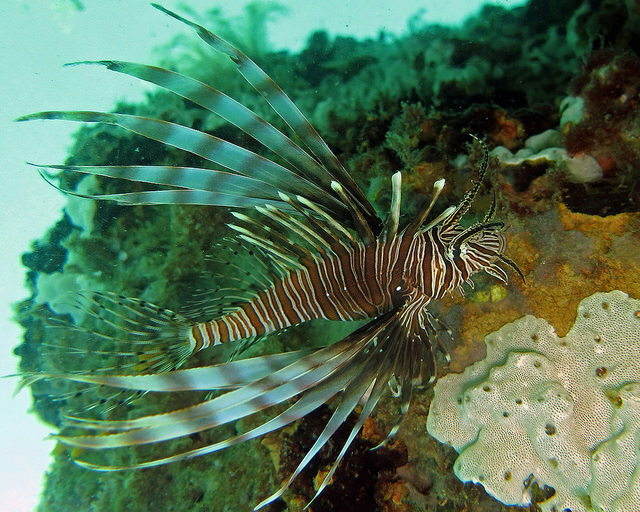 Increasing numbers of invasive lionfish at the East Banks have been documented in recent years.3 It’s possible that these lionfish, like the one pictured below, could be playing a role in disrupting the processes I just described, or otherwise have a hand in the bleaching event some other way, like bringing a disease from their native habitat that the corals are unequipped to deal with. By the time the damage had been noticed and extensive analysis had begun, it seemed as though the event had ended. 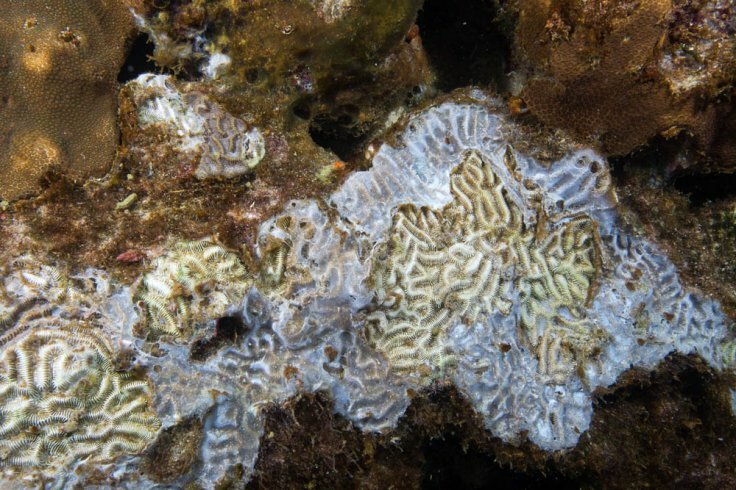 Bleaching had already ceased to spread, and no additional organisms around the reef were dying at rates that were out of the ordinary.1 Last summer’s bleaching event destroyed coral colonies that have been growing for hundreds and thousands of years in a matter of days and weeks. Though scientists have still been unable to pinpoint how this event came to be, it is crucial that we understand as much as we can about the causes of this event so that we can appropriately act to end it, and prevent future events of the same nature both in the Flower Garden Banks and in vulnerable reefs around the world. “Scientists Investigate Mysterious Coral Mortality Event at East Flower Garden Bank.” Scientists Investigate Mysterious Coral Mortality Event at East Flower Garden Bank. National Ocean Service, 9 Aug. 2016. Web. 21 Mar. 2017. Davies, Sarah, Marie E. Strader, Johnathan T. Kool, Carly D. Kenkel, and Mikhail V. Matz. “Coral Life History Differences Determine the Refugium Potential of a Remote Caribbean Reef.” BioRxiv (2016): n. pag. Web. 21 Mar. 2017. Johnston, Michelle, Marissa Nuttall, Ryan Eckert, John Embesi, Travis Sterne, Emma Hickerson, and George Schmahl. “Rapid Invasion of Indo-Pacific Lionfishes Pterois Volitans (Linnaeus, 1758) and P. Miles (Bennett, 1828) in Flower Garden Banks National Marine Sanctuary, Gulf of Mexico, Documented in Multiple Data Sets.” BioInvasions Records 5.2 (2016): 115-22. Web. 21 Mar. 2017. This entry was posted in Uncategorized and tagged 2017, Adam, coral disease, Flower Garden Banks, invasive species, reef conservation. Bookmark the permalink.